Man this is a lot of panels! And I ain’t even tired! AIN’T EVEN TIRED. I should do all my comics with energy drinks! Except sometimes it works and sometimes I crash before I even get the benefits. But I really think this comic turned out nice, don’t you? 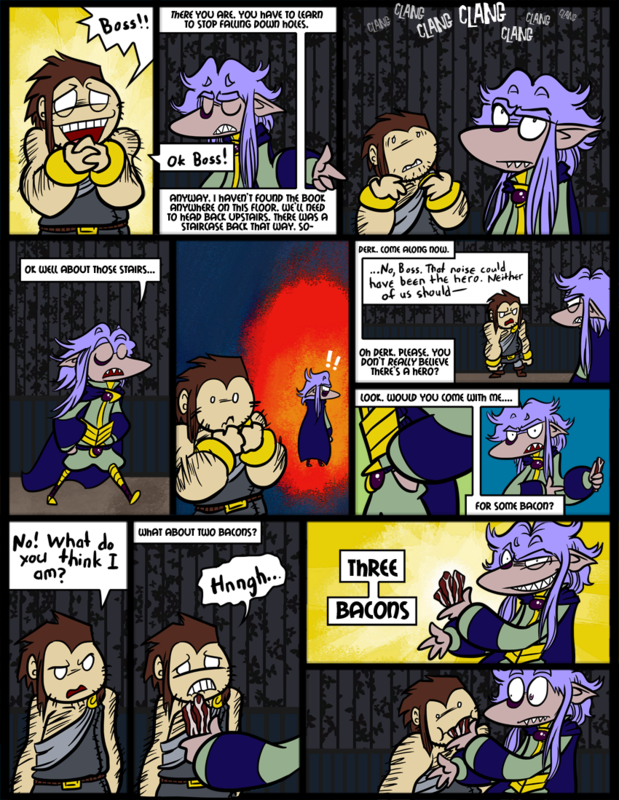 Nobody can resist the power of the bacon! This is why both Skärva and Lorelei keep some pocket bacon around. Derk had some but he ate it. Burn, orange fury, BURN!!!! Wahahahahahaha!!! Also, it’s not just bacon. It’s pocket bacon! What better way to fill your hyperspace pockets? Derk is now a pretty, pretty princess. Chocolate-covered bacon is great, but only for the first piece… that’s all I can handle. Odd, I can scarf down a whole bar of chocolate with bacon bits. I havn’t had chocolate-covered bacon… that’s another story I guess. Oh, and I found bacon jerky. XD Like Slade said, I’m starting to see the Scooby Doo influence now. Also, my captcha says “synectic fetyrke.” That sounds like a torture device. <—– Thought it was Scooby Doo before it was cool. Acknowledging Scooby Doo influence is mainstream? bacon is there anything it can’t do? Pocket bacon is the best bacon. ONEBACONONEBACONANYONEFOREON-TWO,TTWWOOBACON,GOING ONCEGOINGTWI-THREE!THREEBACON!GOINGONCEGOINGTWICE SOOOOOLD, TO THE ONLY GUY IN THE ROOM. Question; So I just recently stumbled onto one of those audience response-based forum comics, and I happened to notice more than a passing resemblance between Muschio Malto and Skarva. Draw any inspiration from Divequest, or just great minds think alike? Orange Supernova sounds like a beverage. or a band.